MiniFinalDrives offers customers the best prices on Caterpillar finals drives and travel motors. Choose between these Quality final drive motors for Caterpillar mini excavators to discover the perfect replacement for your broken or old part. We ship all orders Fast and Free, and every product features our Lifetime Replacement program. Not sure which part you need for your Caterpillar excavator? We have over 50 years of experience working with heavy machinery, and we’ll find the correct part for your machine. 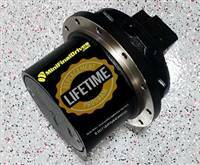 To learn more about our final drive motors for Caterpillars, give us a call today!